Library of America, 9781598535549, 1034pp. 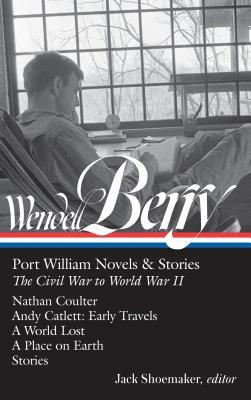 For more than fifty years, in eight novels and fortytwo short stories, Wendell Berry (b. 1934) has created an indelible portrait of rural America through the lens of Port William, Kentucky, one of the most fully imagined places in American literature. Taken together, these novels and stories form a masterwork of American prose: straightforward, spare, and lyrical. Now, for the first time, in an edition prepared in consultation with the author, Library of America is presenting the complete story of Port William in the order of narrative chronology. This first volume, which spans from the Civil War to World War II, gathers the novels Nathan Coulter (1960, revised 1985), A Place on Earth (1967, revised 1983), A World Lost (1996), and Andy Catlett: Early Travels (2006), along with twenty-three short stories, among them such favorites as “Watch With Me,” “Thicker than Liquor,” and “A Desirable Woman.” It also features a newly researched chronology of Berry’s life and career, a map and a Port William Membership family tree, and helpful notes. WENDELL BERRY (b. 1934) is a novelist, poet, farmer, and environmental writer and activist. He has published over 50 books, including over 25 books of poetry, 16 essay collections, and 8 novels. In 2010 he was awarded the National Humanities Medal by President Obama, and in 2013 he was elected as a Fellow of the American Academy of Arts and Sciences. In 2016 he received the Ivan Sandrof Lifetime Achievement Award from the National Book Critics Circle. He has made his home with his wife, Tanya Berry, in Henry County, Kentucky, for the last 50 years. JACK SHOEMAKER is the Editorial Director of Counterpoint Press, publishing the work of Gary Snyder, M.F.K. Fisher, Evan S. Connell, Robert Aitken, Anne Lamott, Jane Vandenburgh, and many others. He has worked with Wendell Berry for more than forty years.